Anyone who follows my blog surely knows that my very favorite thing is to make something new from something old. I hate to throw away anything that still has life in it and I don’t like to waste things. We live in a throw away society, and I think that’s sad. The first dog bed was made from a remnant I bought to make a dog bed. I was a little irritated when I started sewing, because there was a hole in the fabric that I had not noticed earlier and I ended up having to make a small bed instead of a larger one, as I had intended. Fortunately one of my sons has a little pekingese that will love it, so it ended up being fine (although I learned my lesson, check out remnants carefully!). That bed was a simple rectangle with several thicknesses of quilt type batting. I simply sewed a top and bottom piece together (inside out) leaving an opening large enough to stuff the batting in, then turn right side, put in the batting and flatten it out, and sew up the opening. I had enough extra fabric to make a little bone shaped toy made basically the same way but stuffed with the type of batting I use for stuffed animals. I put a red box around the toy so you could see it in the picture as it tended to fade into all of those doggie foot prints! 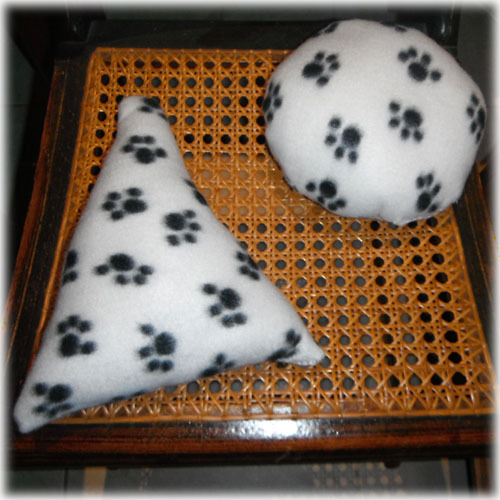 I also got 2 other toys out of it, for my oldest son’s 2 dogs, a simple triangle (not too hard) and a disk (much more difficult –there must be a secret to sewing in a circle–it’s a good thing dogs don’t care that much about perfection!). Of course, I still needed a bed for my much larger golden retriever, Pauli and I didn’t have another piece of fabric that size. I didn’t want to head to the fabric store (which is quite a hike for me–our local Walmart does not carry fabric anymore, very sad!). BUT I did remember that I had some sheets that I had put away to get rid of but had not gotten around to it. They were flannel but the nap was worn. 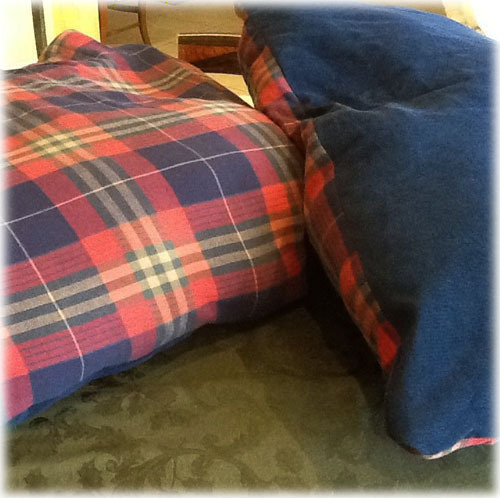 I pulled out the flat sheet and it was in good condition (no holes) and I thought the red and navy plaid would look pretty ritzy. Then my oldest son and his wife decided that they did indeed need 2 new dog beds for their dogs Angus and Bart. There was still quite a bit of fabric left over from that sheet. 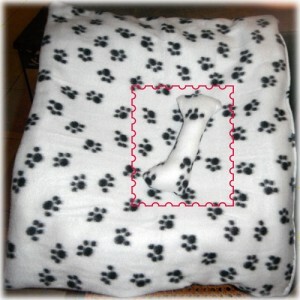 You can easily get 2 dog beds (approximately 26×36 inches) from one queen size sheet if you use it for both top and bottom. But I needed more fabric to make both of them, so I started looking through my stash. I found some navy corduroy which was actually an old bedspread I had made for my boys when they were small. I had saved it all these years because the fabric seemed like something I could reuse. And I was right! I made these both the same way I made the others except that I used the stuffing from 2 large square sham pillows I had but had never used. I’m not sure why I had them, but they have been hanging around in the way for quite some time. I’m glad I found a use for them. Don’t you hate things that are big enough to be in the way but too good to just get rid of? The navy corduroy was a perfect match for the blue in the plaid (complete serendipity). It turns out also that both fabrics are dog hair magnets, but I think that’s probably not such a bad thing. I would rather have my dog bed collecting dog hair than my floor and my rug and…well you get the idea. These should all be completely washable. So, there you have it. Inexpensive to free (depending on where you get your batting, if you have to buy that it could get a little more expensive –you might also consider buying inexpensive pillows and use the stuffing from those). Washable. Quick. Easy. They even would make wonderful gifts. And these are good beginner projects for people learning to sew. You are so right about being able to pick these things up cheaply at second hand shops. PLUS sometimes friends and family are thrilled to give this stuff away (my other son mentioned he had sheets he would willingly donate to me when I told him what I had made!). Lots of people have old stuff they hate to get rid of that they would love to see turned into something useful, but they do not craft. It never hurts to ask. Lots of lovely makes to enjoy – especially the paw print pieces. In addition to charity shops here, we have freecycle and you would be amazed at the wonderful things it is possible to get hold off, so much better than just dumping them. Hope you have a good week. They have freecycle here too, but I haven’t tried it. Fabulous dog beds. My three need new ones and rather than buying them I might just try and upcycle some old blankets that I have here – although it will need quite a lot of material for the one for our Giant Schnauzer!! The size I made is the size of the large airline crate. For a giant schnauzer you might go up a size (that’s where I got the measurements) as they are about the size of my old spinone boy I think. I bet yours was just as good! You cannot see any mistakes on the dark fabric. 🙂 There are a few puckers, because the old sheet fabric was a little “stretchy”. But you know, the dogs won’t care a bit! 🙂 I’m very lucky that Pauli is not a big shredder. She does occasionally chew a stuffed toy, but usually if it’s old and has started to come apart, then she will worry at it and pull out the stuffing. One of my son’s dogs (China, who was one of my puppies, so I suppose it’s my fault! haha) did chew up a toy I made for her recently. She was after the noisemaker. Silly girl! My theory has always been that they were too hot, but I’m not really sure. The tartan fabric is great, I’ve been sorting through some of my old fabric and have stored some of it in those vacuum bags so everything takes up a lot less room. I never throw sheets etc away, I can usually find a use for them. brilliant dog beds-the dog looks so happy with it! 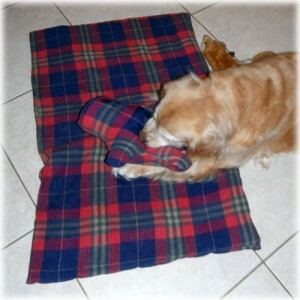 The doggies are going to be super cosy and while they are tucked up, a matching toy to chew! Great idea re-using fabric – great upcycling! I love the bone that you had to cover with – very cute addition.